What is the Tuition Voucher program? 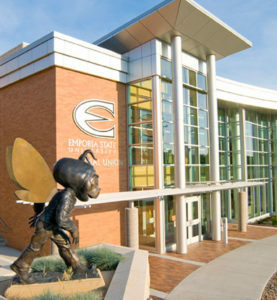 This program, exclusive to Emporia State University (ESU) and Flint Hills Technical College (FHTC) came into existence beginning with May 2008 graduates and has been highly successful since its inception. ESU & FHTC administer the program for The Jones Foundation and identifies eligible students upon admission. To help pay for your education, the program offers $1,000 per year, up to four consecutive years at ESU and up to two consecutive years at FHTC, to help pay for your education. It is limited to only high school seniors. It is not need-based; an application is NOT required. It is limited to ESU and FHTC. It is paid directly to the institution; $500 per semester, provided eligibility is maintained. If eligible, a student may receive both the Tuition Voucher and Undergraduate Education Grant. High School Seniors currently residing in Coffey, Lyon or Osage Counties, graduating in the current academic year and attending either ESU or FHTC in the fall immediately after graduation. Students must be enrolled full-time (12 credit hour minimum) and seeking an undergraduate degree. Students attending ESU may be eligible to receive the grant for the four years following their high school graduation, provided they successfully complete 12 credit hours and maintain, at minimum, a 2.0 grade point average (gpa) EACH fall and spring semester. Students attending FHTC may be eligible to receive the grant for the two years following their high school graduation, provided they successfully complete 12 credit hours and maintain, at minimum, a 2.0 grade point average (gpa) EACH fall and spring semester.